I would like to demonstrate how to create Sitecore WebAPI based custom service and utilize native Sitecore/.NET security mechanism. The ServicesApiController is part of Sitecore.Services.Infrastructure.dll and it implements .NET ApiController. Usage of ServicesApiController ensures continuation of Sitecore global item security policies and individual filters that can have individual requirements. My goal is to create stateless WebAPI based service in Sitecore with authentication and authorization against Sitecore Security. How to refresh this token, its expired after 20 min. Just make another post request for the same service “sitecore/api/ssc/auth/login” and use the new key. Alternatively, you can disable token or increase the timeout, depends on scenario and circumstance. Really nice and work well.. 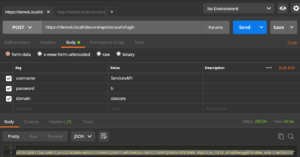 Currently I have a SPA (on Sitecore 9) that expose WebApi and from frontend side, and I need to somehow implement federated auth here at this point.. So looks like I need somehow bypass users to login.microsoft.com during OWIN auth and after that handle their cookie or token.. I am not quite clear on reqs, but SPA should not behave any different in SC vs otherwise. Sitecore content can be exposed over Odata Item Serice, available in 9 now. Shoot me an email, if you have any questions. I couldn’t get it to work in Sitecore 9.0.1 can you please point me to the right direction? Do you get any specific errors in config? I tried in 9.0.2 – have had no issues. Once you have the token, what are you doing with it? https://HOST NAME/sitecore/api/ssc/auth/login , im getting this issue. Please help me to resolve this issue. Try to use postman, using POST method and with username, password and domain imbedded as a params in the body of the request.